Only 35 days had passed since we returned to Africa. What we had been through in the last four countries was so intense that they seemed 350 days. We accumulated more than 2000km of exuberant mountains, crystal-clear blue lakes, african jungle, savanna and bush filled with wild animals. However, by the time we got to Mbeya -a big city in southern Tanzania- and were ready for a well-deserved break, Josefina, Julia's sister who had come to visit us, was ready to go. The reward for having cycled across such rough roads was not only a couple of great bed and food days, but fortunately it was Malawi. This place is one of the most beautiful, quiet and easy-to-ride countries in the whole Africa, and it was a particularly beautiful Malawi now because, having Josefina as a company, we were forced to reduce our pace of cycling-warriors, so that she could keep up with us. Few are the kilometers separating Mbeya from the border. However, the last bit is an uphill stretch, taking us up to some refreshing 2300m high, before we can reach an uninterrupted 50km downhill all the way down to lake Malawi, an almost 2000m loss in altitude. Believe me: nobody wants to keep on climbing after having ascended more meters in the last month than it's possible to remember. However, we had no choice: this was our only way to the promised paradise. 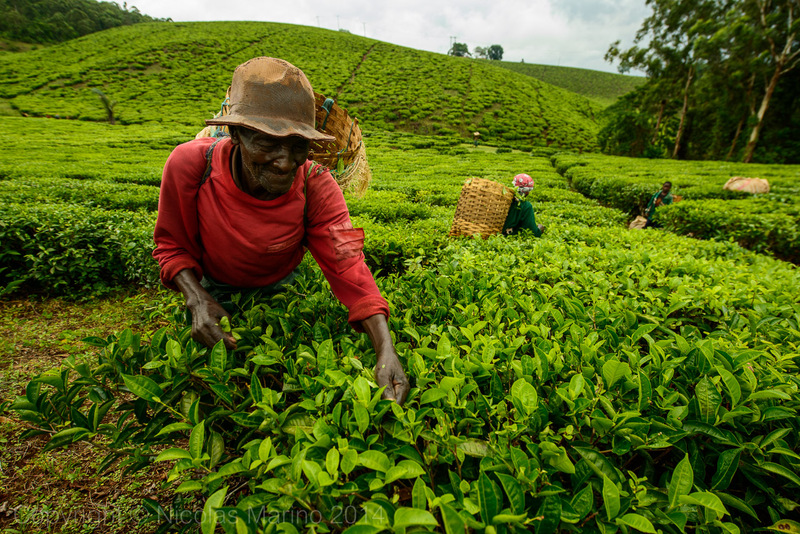 Along the way, once again, we come across the beautiful tea plantations that I enjoy so much. There are few the collectros that are friendly when I approach them. I still can't understand why, but aside from the plantations in Sumatra, there hasn't been one time in which they had not asked for money. In Tanzania, they get particularly harsh if you refuse. We have cycled for more than a 1000km through the most forgotten -and certainly unknown- part of Tanzania. Except for some wild animals -and also the Sukuma-, there hasn't been much to see. People have been very kind, discreet, and they rarely did chase us with the never ending "mzungu, give me money", mzungu meaning white man. However, it is probably this "lack of attractiveness" that gives this part of Tanzania all of its magic. It is the case of pretty much every place that has stayed away from the reach of mass tourism and everything wrong that comes with it. Even though I know I would have been stunned by the beauty of the Kilimanjaro and the Serenguetti, I don't regret not having visited Safariland in this adventure, because if I had, It wouldn't have been one anymore. We have been able to see a different, and sincerely beautiful side of Tanzania, beautiful for precisely having "nothing to see", which is what made it so special. That's why I leave with a very beautiful memory of the country, except for those criminals behind the steering wheels whom I will never forget. If Malawi has to be told, its lake must be told. This is not only for its extraordinary beauty, but also for the magic it brings to its people, all of whom, in one way or another, make a living out of it. 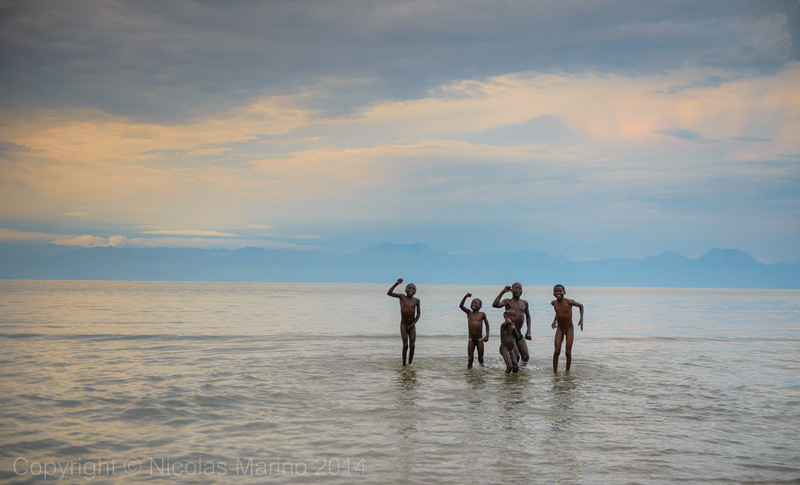 The life of Malawians revolves around their lake. 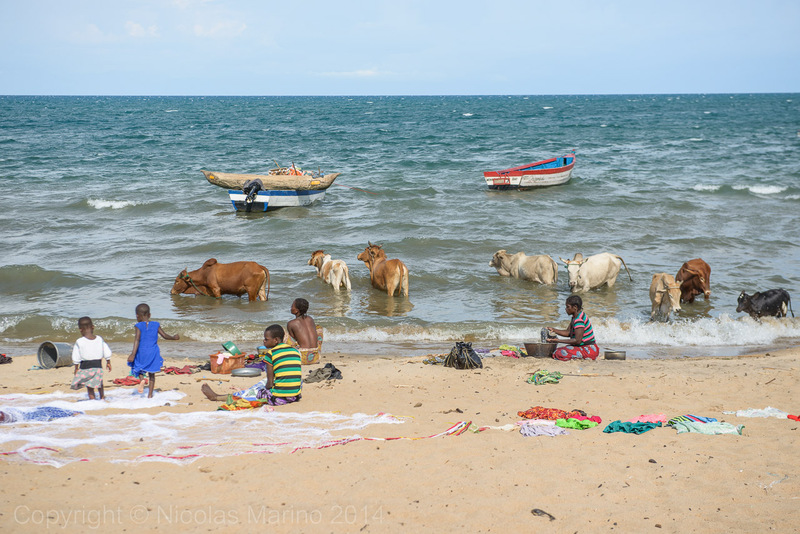 The great Malawi lake, of blue and turquoise crystalline waters, that extends all along this small country. It is such a simple country that there are not many adventures to tell. A country so simple that there isn't much adventure to talk about because Malawi is easy, it's Africa for beginners and it offers no challenges for the bicycle. The people are warm, easygoing, friendly, just as its weather. 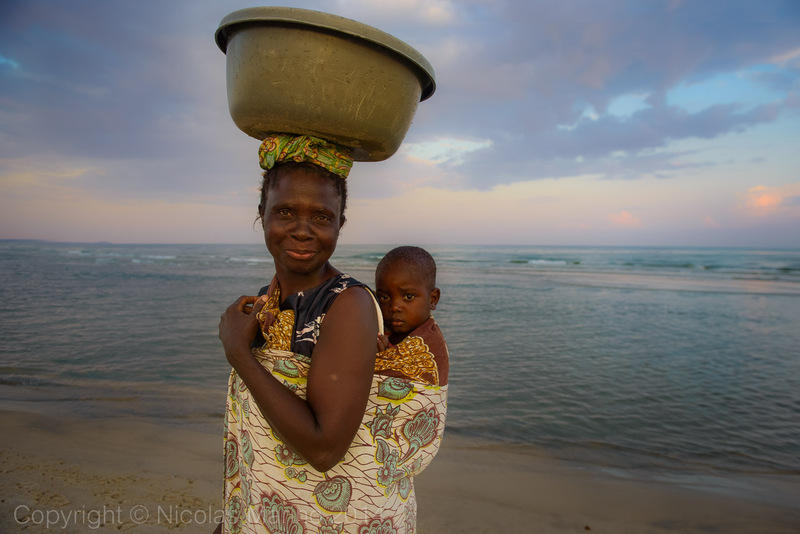 It is because of its people and weather that Malawi is known as "the warm heart of Africa". Therefore, as we weren't searching for adventures in Malawi, but to rest in the warmth of its beauty and its gentle roads, this will be a visual journey, rather than an adventure story. 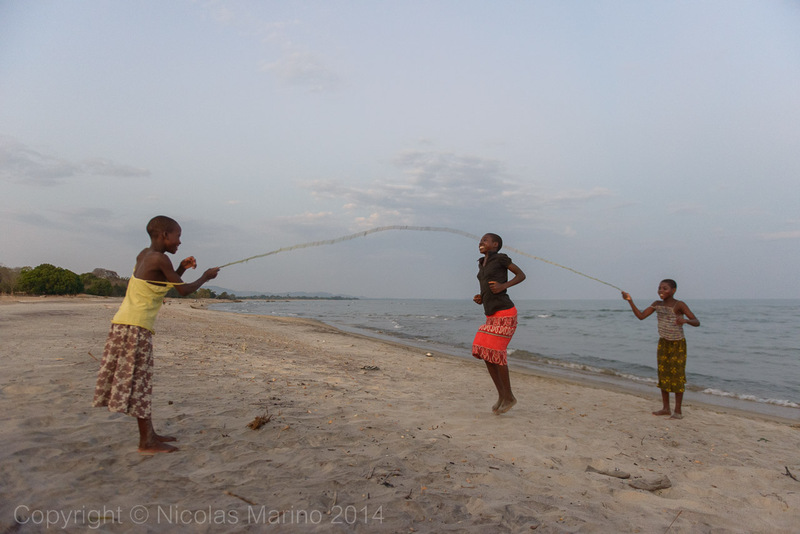 Entering Malawi from the north, through its border with Tanzania, brings you immediately next to the lake. It's the end of the day and the children play around splashing their feet in the water, having fun for the simple fact of just being kids. 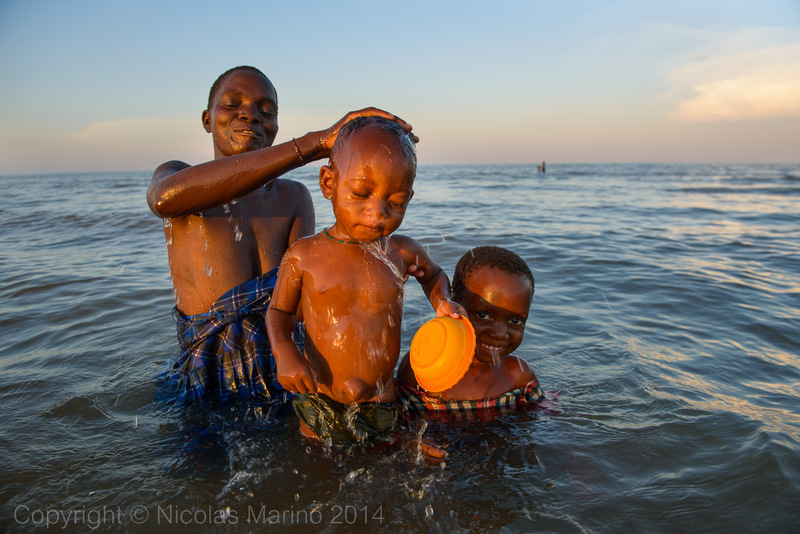 Children in Malawi play in the lake since their first day on earth and they grow up next to it. The eldest ones -natural born fishermen-, wait till the sun goes down to go to work, preparing for the time to sail deep into the lake and fish all night long under millions of stars until the first rays of sun come out marking the beginning of a new day and the end of the fishing journey. 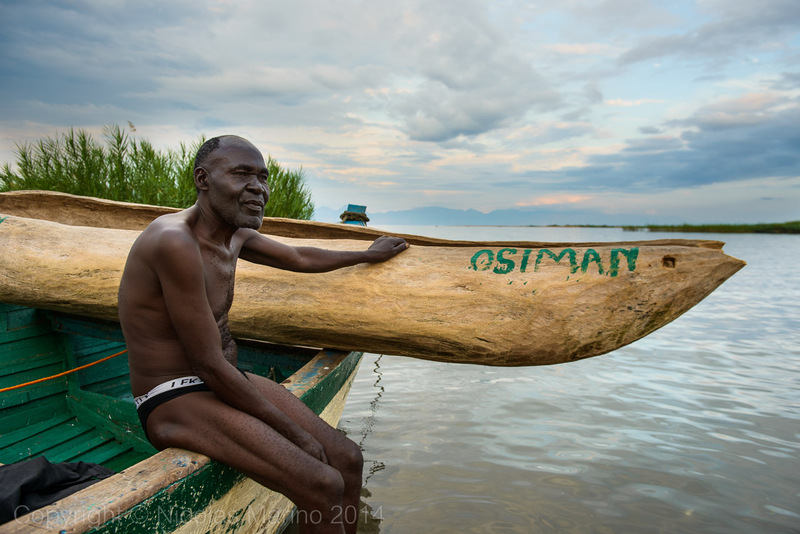 Malawian fishermen have a quiet look, as if they were always reflecting about life. They spend almost their entire lives either in the lake or on its shore, but they rarely spend too much time in the village. 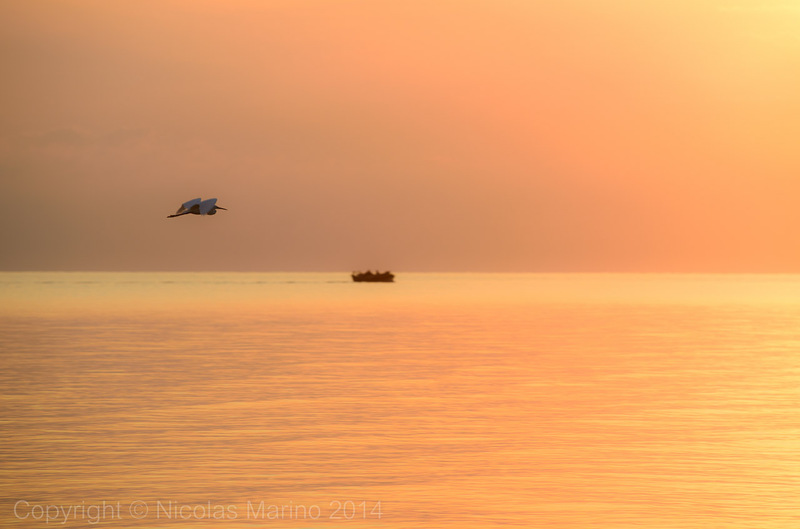 The sun begins to rise as early as 4:30am and by 5:00am, its rays paint the sky and the lake in gold and pink tones. After about ten hours of hard offshore fishing, fishermen start returning early in the morning, at the time birds pass by fluttering around to have for breakfast the fishes that come near the surface. As minutes go by everything turns blue and the horizon line magically dissolves. The lake and the sky caressing each other, evolving into some unique and indivisible being. 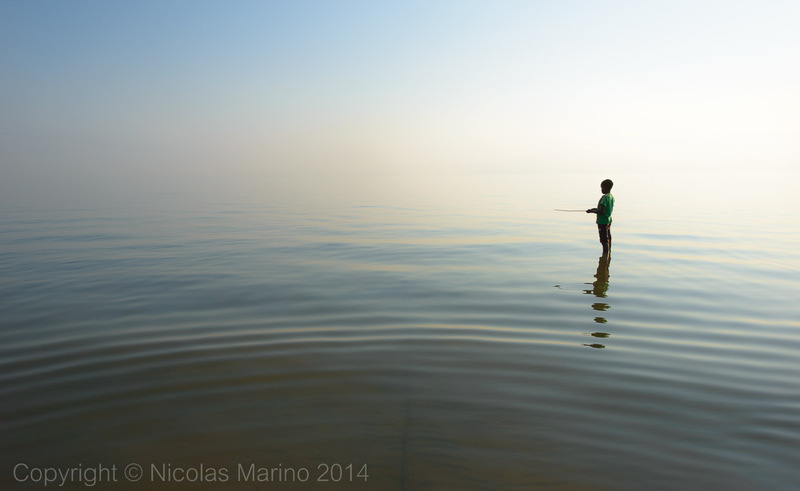 The fishermen of tomorrow walk over this great mirror of a lake and wait patiently till the first victims bite the hook. Women go shopping with their buckets on their heads. They walk on the water, carrying their purses, as any other urban woman of any western city would do, along the streets. It's inevitable to wonder why they walk on the water and not along the shore. Maybe that's what these images have to reveal about the bound existing between these people and their lake. 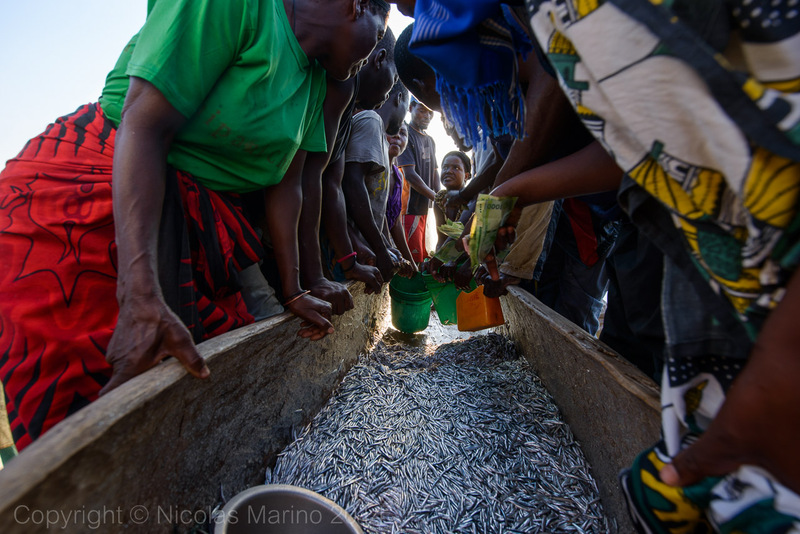 While children practice to make a living out of fishing one day in the future and some women go shopping around the lake, the men come back home with the outcome of a long night of work. It's 6:00am, the sun is already high up in the sky and life thrives at the shore of the lake, in the hustle and bustle fashion of any other cosmopolitan city enter. 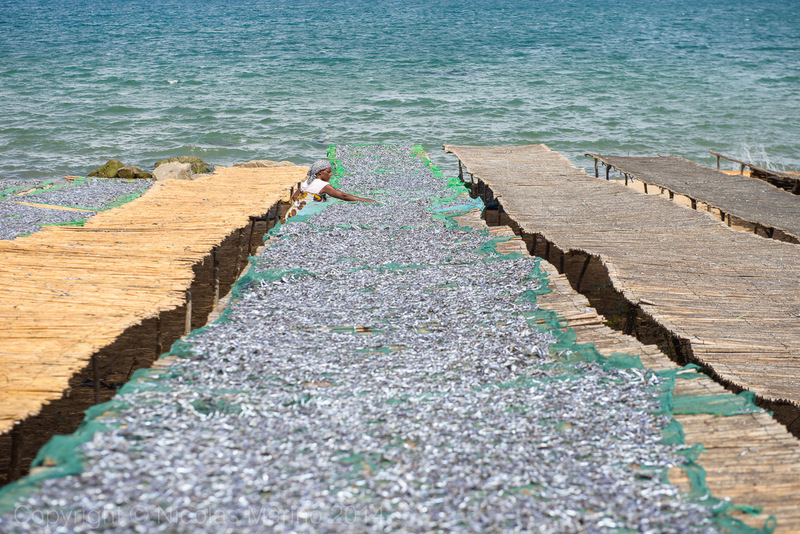 Wooden boats return overflowing with thousands of little fishes in them. The sale is carred out in a kind of public auction. Women are the ones coming from the villages to buy the merchandises. Every request is done yelling and disputes for the products are all over the place. The women fill all of their buckets. They will have to carry a heavy weight during the rest of the morning, until they finally take the fish out to dry in the sun. 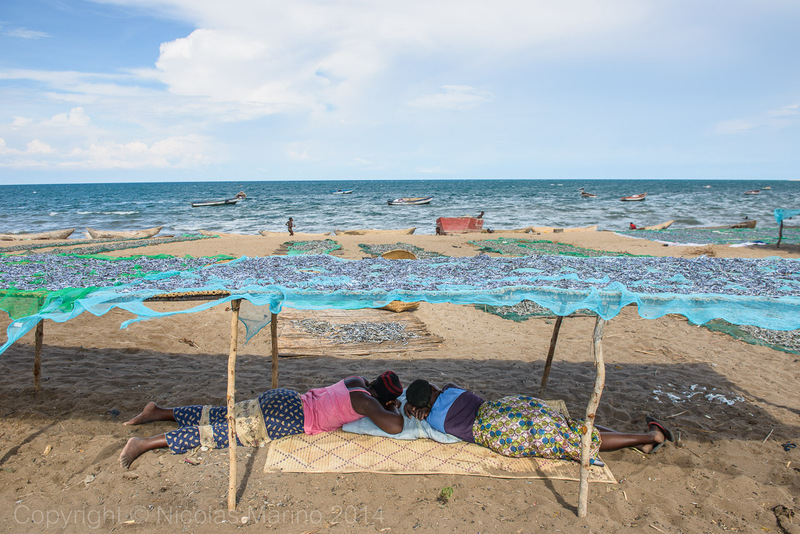 During the rest of the day, women will lay the fish over long wooden tables that are set up on the beaches along the shore of the lake. Fish will be uniformly distributed over the tables and left to dry during the rest of the day and maybe several more before taken to the market stalls in the villages. 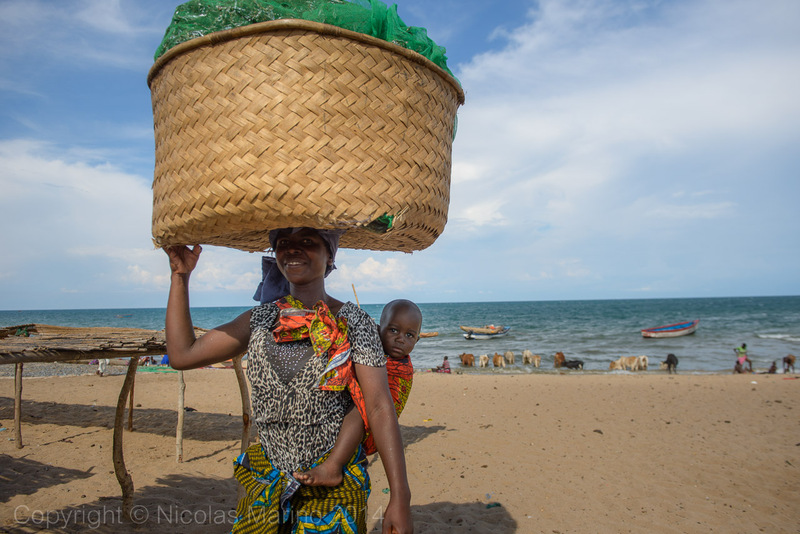 Once again, they will carry the fish inside big baskets for the final stretch to their homes, the town, the canteens. 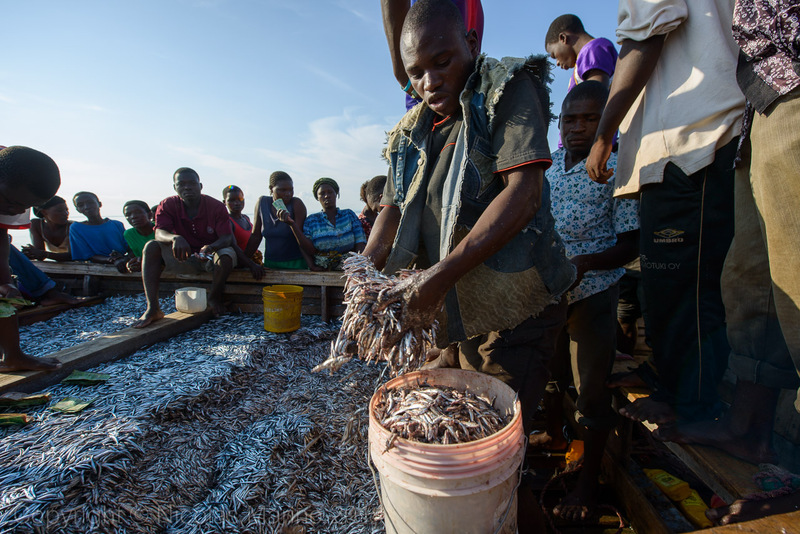 By the end of each day, when fishermen go back to the lake, they will have earned a few more cents that will allow them to survive one more day. The job is hard, but the reward is poor and yet, Malawians never hesitate to offer big broad smiles. During daytime the sun becomes impossible. At only 450 m high, it gets pretty hot on the lake and the tropical heat sets in with great determination. Now it's time for the cattle to go for a bath and for women to do the laundry. When days use to start at 4:00am it's essential to take a break and especially find shelter from the sun which, past midday together with humidity, has the power to overwhelm and make the exhaustion impossible to fight. Women, the eternal workers of Malawi, lay down in the shade underneath the tables in search of a quick break from their long day. By the time a new day comes to an end and the landscape turns golden one more time, hard work gives way to the tasks of daily life. The lake becomes the great communal bathing room where people enjoy refreshing themselves in its warm waters. It doesn't need any adjustments: the temperature is perfect. Everybody enjoys the lake and it seems to bring true joy to its people. Once the bath is over, people return home under a blue and pink sky. They return home to the village, to the mud and straw huts built on the sand. People offer me peaceful smiles that fill my soul. They transmit the calmness and serenity they carry inside, as if all they needed were their lake in order to have a happy life. It's quite hard to avoid romanticism when you are presented with these idyllic images of lake Malawi, but the life here isn't certainly easy. All along the shore and until the night finally sets in, the kids end the day playing around as much as they can, as all kids should. Laughing like crazy, they transmit joy with all their energy. One more day comes to an end. Just as in the rest of the black continent, the nights in Malawi are black. There is no electricity, just the fire. Like the Malawians do, I decide to go for my own walk on the water and I start to understand what being absorbed by its magic feels like. This lake has a charm that empowers you, it captivates you, it catches you, it doesn't let you go. Days go by and the symbiosis between these people and the lake seems clearer to me. 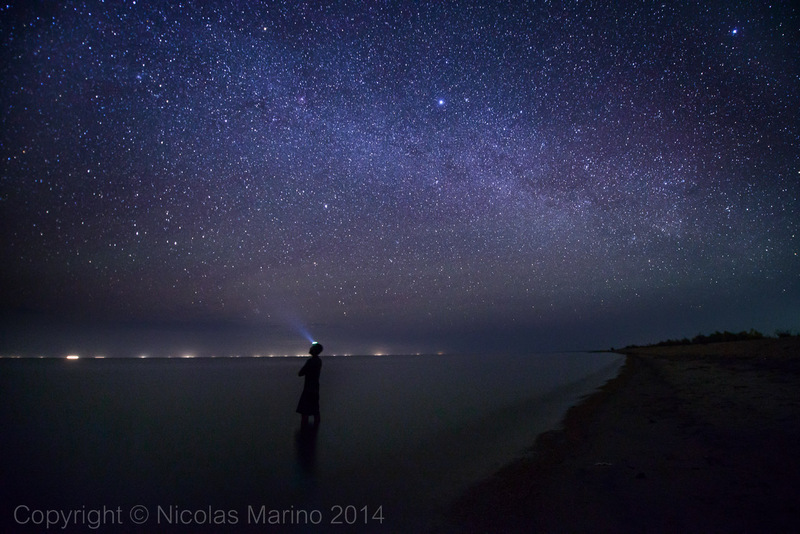 As I walk on the lake, leisurely refreshing myself in the warmth of the night, I count stars. The night is so dark that I feel I can see them all. Now that the waves and ripples are gone, the lake becomes a mirror once again and the horizon is now delineated by thousands of little lights coming from the fishermen's oil lamps. For them, this night will be one more working night spent at the lake's heart. Now it's time for bed. Nothing compares to spending the night by this lake, sleeping next to that person we choose for our life. 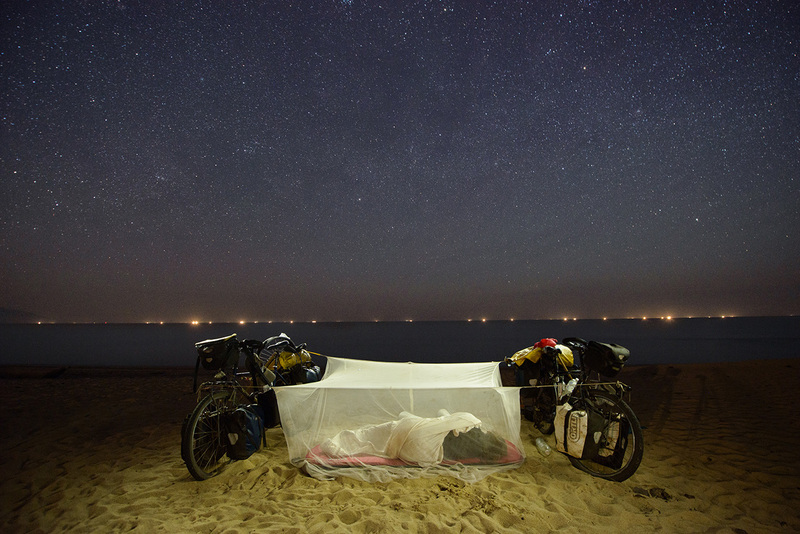 We have spent many unforgettable nights under the stars, in the jungle, in deserts, in the bush, in the steppe, and now we are in lake Malawi. If it had been possible, I would have given Julia a thousands stars from that sky for her company, for having become my right leg during this dream adventure. However, because of those things that sometimes can't be explained and the mind's treacherous tricks, I started doing completely the opposite, which lead me to a permanent state of regret throughout the coming months. 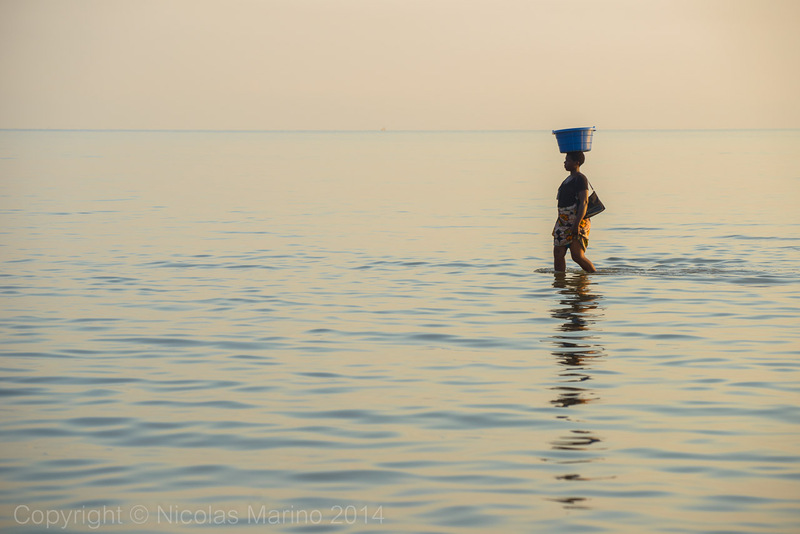 Malawi, with its beauty and simplicity, meant a change into a more relaxed pace of traveling. 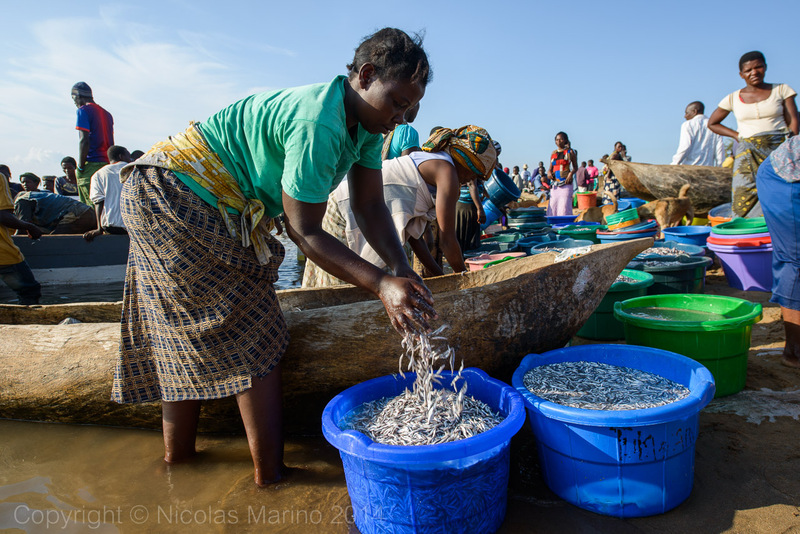 Malawi is the transition between the sometimes rough east of Africa and the gentler south. Malawi forces you to romanticize, it turns romantic to those who are not, for poetry is the only way by which I could describe its beauty. The beauty of this lake is poetic. The images of sunsets, sunrises and nights that have been recorded through my retina are those of serenity inspiring harmony. This country might not offer the adrenaline that nourishes the adventurer, but every adventurer needs quiet moments as well that may invite reflection and that is what this small country of unmeasurable beauty has to offer. 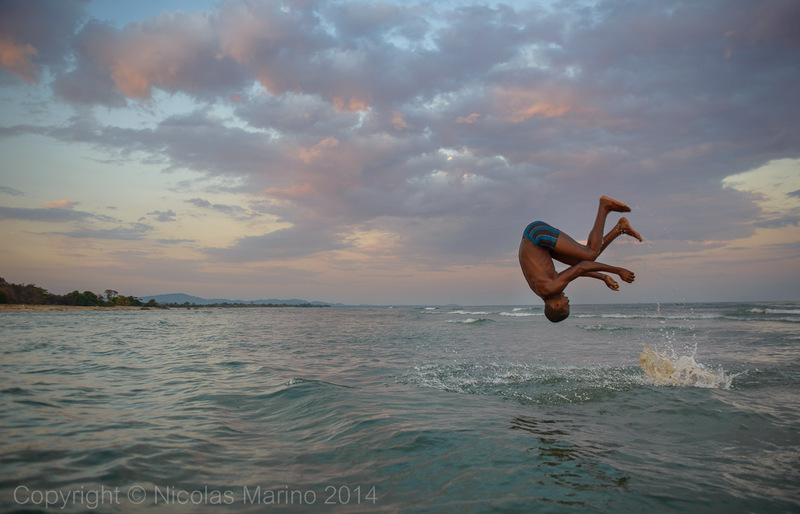 I have fallen under the spell of its lake and, from Malawi on, every time I need a break, Malawi will probably be one of the first places that will come to mind to escape the real world and plunge into a poetic one, where I can walk on water.